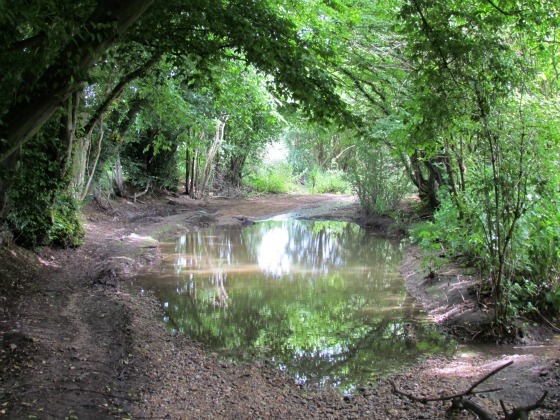 This walk starts in Welham Green and follows old footpaths and lanes to Bell Bar, once a busy stopping point for horse-drawn stage coaches travelling between London and the north. 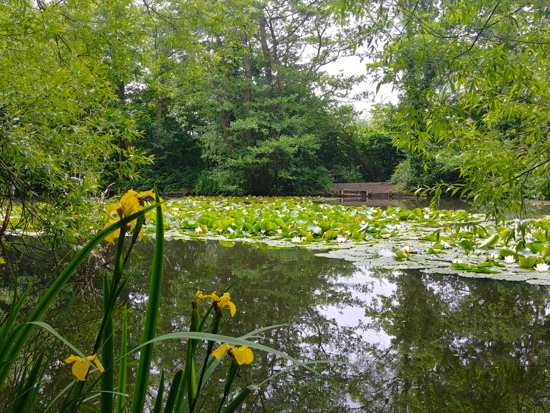 It then continues to Brookmans Park village via Gobions Open Space and Gobions Pond. The route covers approximately a quarter of a much longer walk on this site, the 12-mile North Mymms Way. The start and finish points can be reached by bus or train. 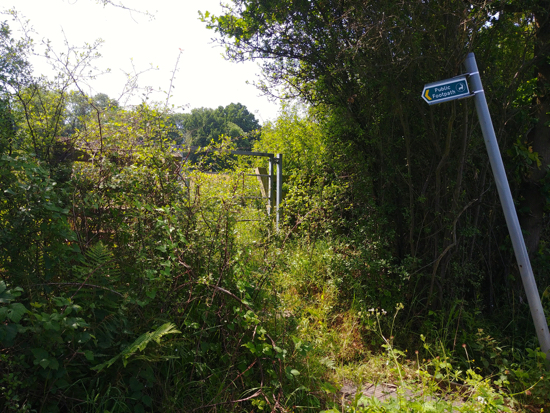 1: This walk starts down a footpath on the south-east side of the railway bridge by Welham Green station. 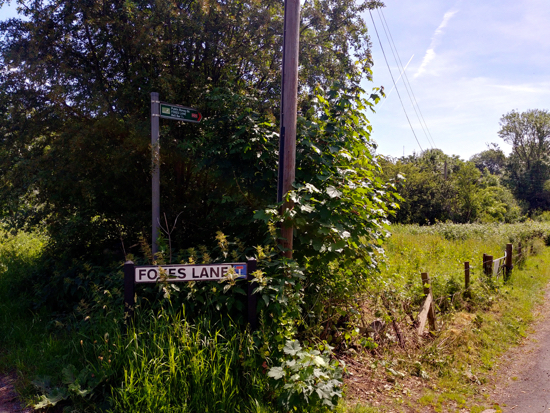 The path, which runs south-east from Dixons Hill Road, is called Foxes Lane. It's marked as a dead end, although part of it is a byway open to all traffic (BOAT) rather than a lane. Walk down this lane, past the caravan parks on your right and left, and then continue as the lane becomes a track. In February 2018 an 18-month experimental 'prohibition of driving order' was obtained by Hertfordshire County Council ruling that only those with permits are allowed to drive vehicles down the BOAT. Width restrictions have been introduced at both ends of the prohibited stretch, as you can see in the image above. 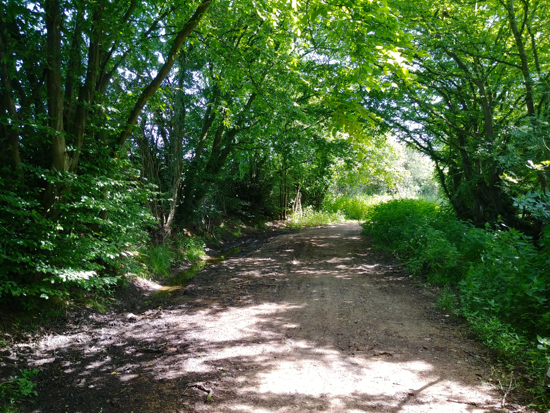 This path used to be waterlogged at times, but Hertfordshire County Council carried out extensive flood defence work on this byway in 2017 in an effort to alleviate the problem. It's been much better since. Continue along Foxes Lane ignoring two footpaths heading off to the left. The first soon after the start of this stretch (see first image below) and the other before a right-hand bend (see second image below). 2: When you reach Bulls Lane turn right and walk down the lane heading south-west for a short distance until you see a footpath sign on your left. 3: Take this path and head across the field diagonally to your left walking south-east towards the woodland. There is no obvious path at this point because this is a little-used footpath. Make sure you head to the right of the tree that appears on your left as you cross the field. * When you reach the woodland turn left and continue walking east and then south-east with the fields on your left and the woods on your right until you reach the gate leading to Bell Lane. 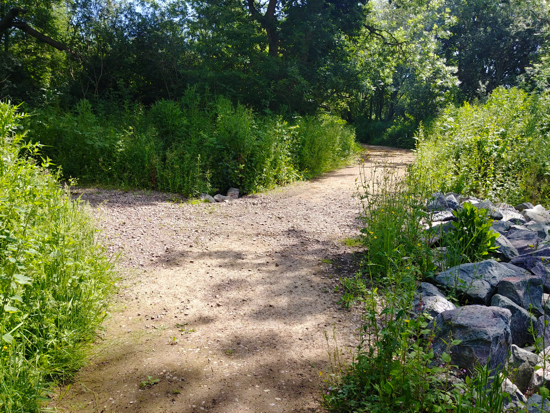 If you are uncomfortable walking across a field with no obvious path you could, instead, turn right when you enter the field from Bulls Lane and follow the path round to your right and head west before turning left at the far western corner of the field. Then follow the path to the left (heading east) with the woods on your right and the field on your left - you will reach the same place as described above * (this is marked in orange on the map above). Both these routes are public footpaths. 4: When you reach Bell Lane continue straight, heading slightly north-east until just before you reach the A1000, the Great North Road. On your right you will see a footpath leading down a gated road called The Drive. 5: Turn right and walk down The Drive heading south-west until you reach the top of Pine Grove. Continue straight down a track to the right of the last house on the top of the west side of Pine Grove and continue walking south-west with Chancellor's School on your left until you emerge at the top of Golf Club Road. Opposite you and to your right will be Brookmans Park Golf Club. 6: Here you turn left and walk south on Golf Club Road until you reach the junction with Brookmans Avenue, Georges Wood Road, and Mymms Drive. 7: Continue straight heading south on Mymms Drive, past Moffats Lane on your right and Calder Avenue on your left, and past The Grove on your right. Soon after passing The Grove you will see a track between the houses on your right. 8: Here you turn right and head south-west down the track until you reach a gate leading to the woods in Gobions Open Space. This area is known as Gobions Gardens. Continue heading south-west, ignoring the path off to your right, until you reach Gobions Pond. 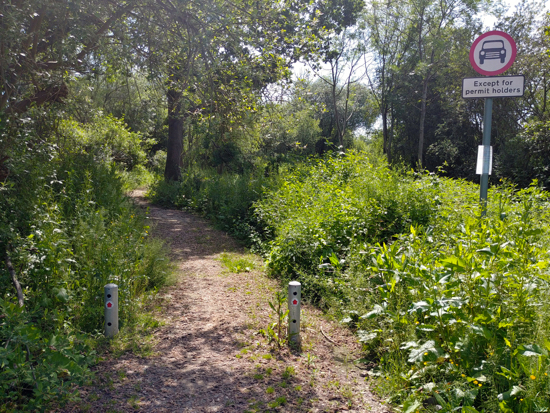 9: Turn left at Gobions Pond and follow the path as it bends round to the right. Keep the pond on your right as you walk along the southern edge of the pond heading west. Continue until you reach the end of the pond and the open field. Cross the field heading north-west in the direction of the play area. 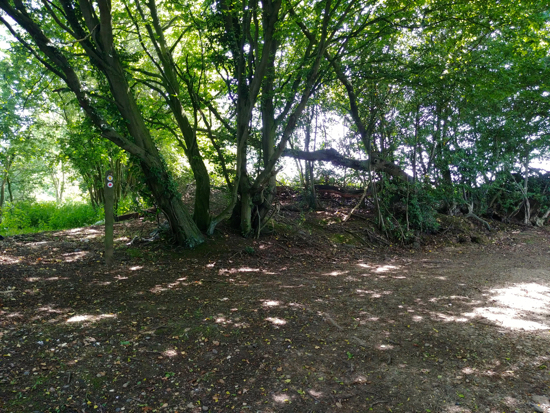 10: In the western corner of this field, just below the play area, you will see a gap in the hedgerow. Take this path and follow it as it heads west with the woods on your right and the field on your left. At the western end of this path go through another gap in the hedgerow as you turn right to reach the gate at the top of Bluebridge Avenue. 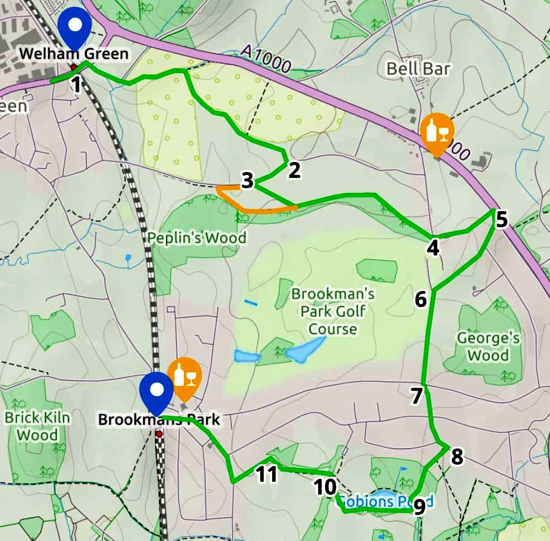 11: Walk south-west down Bluebridge Avenue until you reach Bluebridge Road where you turn right and head north-west to Brookmans Park village centre.